Dark circles under eyes occur generally due to lack of sleep, stress, some disease or it may be due to some hereditary disorders. 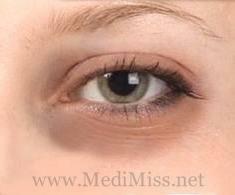 It is common to have dark circles under the eyes. 1. Mix fresh potato juice and cucumber juice in equal amounts. Soak some cotton in the above mixture and put on your eyelids for 20 minutes. Wash off with cold water. 2. Cut a cucumber in thin slices and apply on top of each eye for 20 minutes. This will drain the stress from the eyes and cool it down. 3.Tea bags are found to be very effective as far as curing dark circles is concerned. A cold tea bag should be placed on the top of each eye for 20 minutes everyday. 4. One can use rose water or almond oil for massaging the under eyes dark circle, to get rid of them. 5. Gently press the mount below the index finger of your palm. This will enhance eye sight and also remove dark circles. 6. Grind nutmeg with milk and make a paste. Apply this paste on the dark circles. This will work very well and remove the dark circles. 7. Crush some mint leaves and apply its juice under the eyes. For people having dark circles an 8 hour sleep is a must. At the same time one should drink plenty of water. 8. Make a paste blending tomatoes and lemon juice in equal amounts. Add a pinch of gram flour and turmeric powder and apply the paste and leave it for 15 minutes. This will do wonders in curing dark circles. 9. Harmful rays can also cause eye circles. Hence one can wear sunglasses while going out to protect eyes from harsh sunrays.